Google Phone Revealed: G1 versus the iPhone? The rumors circulated, the news was deemed imminent, and now it’s official. This morning, Google, together with T-Mobile and HTC, officially revealed the hyped “Dream” phone, the first mobile phone to be built around Google’s Open Handset Alliance Android operating system. Bloggers, press and even Google’s founding team of Sergey and Larry were on hand for the Manhattan launch event. Rebranded from the Dream to the G1, an obvious nod to Google, the phone will be available on October 22nd at T- Mobile stores in twenty one cities. It will sell for $179 (with a two year contract), plus a $25 or $35 a month data plan subscription. From the start, the phone will provide Google with gateway access to consumer’s mobile experience. The bundled G-mail and Google services will help make sure of it. (Google has made the software open-source and doesn’t draw direct revenue from Android. Instead, their view is a longsighted one with an aim towards capturing mobile advertising and services revenue later as the mobile Internet market matures. More on this here). To match iPhone applications, the G1 will come preloaded with instant access to Google services including Gmail, YouTube, Google Maps, Google Talk and Google’s calendaring tools. To match Apple’s musical features and iTunes tie-ins, the G1will showcase a mobile music application that connects to Amazon’s Mp3 store. All 6 million songs in the Amazon catalog, all of which are available without DRM encryption, will be accessible. Like the iPhone, customers will be able to browse and hear samples of the music over a mobile connection . To download, they’ll need to use the phone’s faster WiFi networking to download songs straight to the device. To match Apple’s Application Store (Appstore), the G1 will be supported with the “Android Market.” (No word yet on what kind of third party software will be available at launch). •Footprint - the G1 comes in a case that measures 4.6in X 2.16in x.62. That’s slightly longer and narrower than the current iPhone. The G1, with its slide out keyboard is also thicker. The iPhone measures 4.5in x 2.4in x .48in thick. •Keyboard –the iPhone is purely touch controlled when it comes to entering text. the HTC G1 has a slide out complete QWERTY keyboard. The G1 also features a trackball control. •Camera - the G1 features a 3.2megapixel color camera with fixed focus. The iPhone offers a 2.0 megapixel camera. •Battery – the G1 uses a 1150mAh lithium battery. Talk time is pegged at up to 350 minutes via WCDMA or up to 406 via GSM. Standby time is listed at up to 402 hours (WCDMA) or 319 hours (GSM). The iPhone offers talk time of 5 hrs via 3G (GSM) or up to 10 hours via 2G networks. Standby time is listed at up to 300 hours. • GPS – Both phones offer GPS and mapping tools. •Connectivity – both phones support, Quad Band GSM/EDGE (850, 900, 1800, 1900 MHz), Wi-Fi (802.11b/g) and Bluetooth 2.0 with Enhanced Data Rate (EDR). The iPhone handles UMTS/HSDPA at 850, 1900, 2100 MHz. HTC lists G1 HSDPA/WCDMA support at 2100Mhz (Europe) and 1700/2100 (US). •Memory – the iPhone is offered with 8GB and 16GB flash hard drive storage. 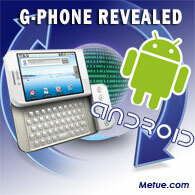 The G1 is to be sold with 256MB of ROM and 192MB of RAM. An SD Card expansion slot is available for expansion with a 1GB card preloaded. •Colors – the iPhone is available in Black and White. The G1 will be sold in Black, White or Brown. •HTC Dream on Android: By November?